One thing I like about a good paper tourist map is that place names, buildings and parks don’t appear and disappear every time I touch it. They are all in exactly the same place as the last time I looked at it. I hear you. You are saying, “Why would someone pick up a map, wouldn’t you just use your phone?” Sure, the phone is great, but many people I’ve met while traveling do not pay for data while abroad. They use wifi when they can find it, but they rely on paper maps. Since I’ve been traveling, I’ve picked up several free tourist maps. 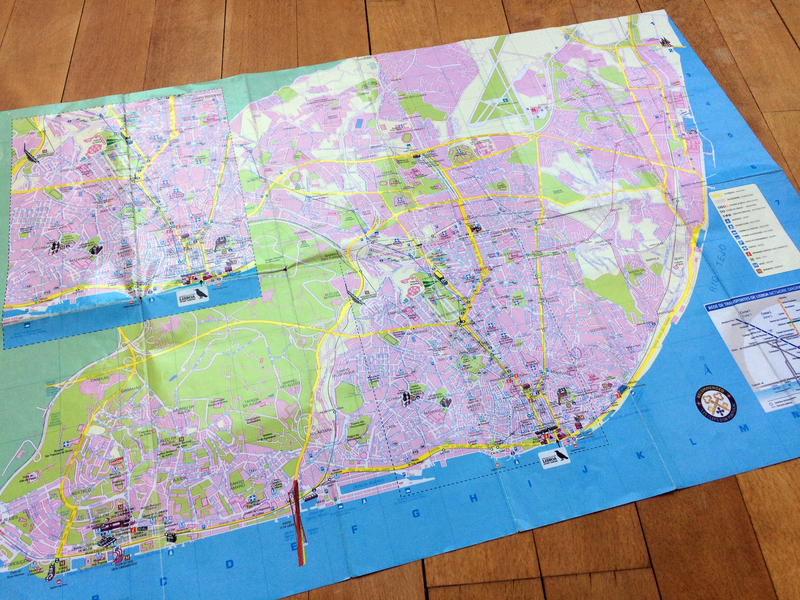 A paper map can give you a good overview of the area. If it’s designed properly, you can see clusters of attractions and determine which direction you want to head in. 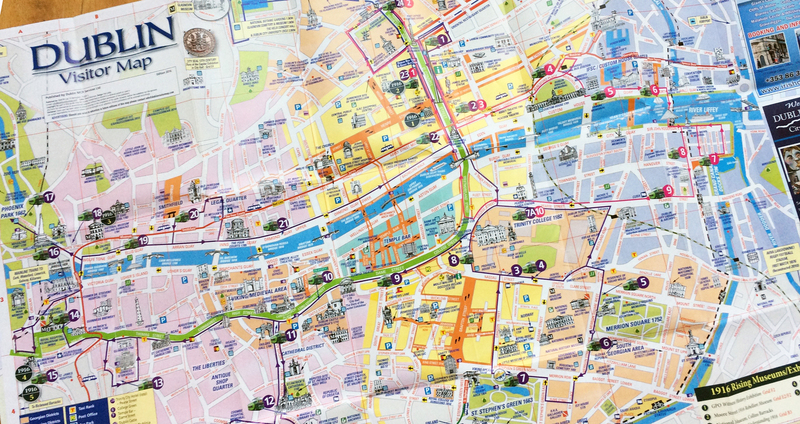 A good tourist map will tell you all you need to know for the first 48-36 hours in a place. It can also transfer a feeling about a place. They can be good for navigating without your phone (gasp! ), but only if some simple graphic design rules are followed. I’ve used some good ones and not used some very bad ones. 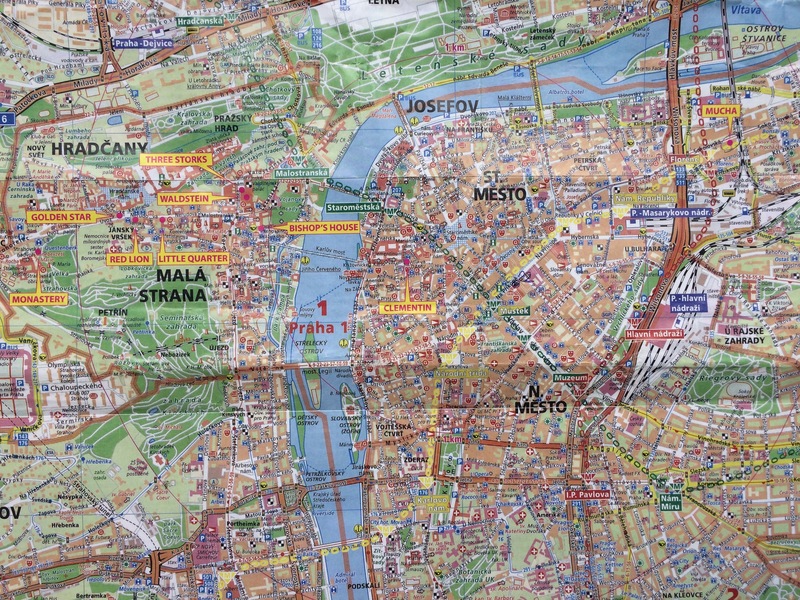 What makes a well designed map for a Tourist? Hold on, let’s start with the question that should preface any design project, no matter how big or small. Who is the audience for this design? Who is this map for? It is for the Tourist. Let’s dig deeper. Who is the Tourist? Our Tourist is a casual explorer, with limited amounts of time, limited experience with the language and customs and who knows next to nothing about where they are. They want to see the sights and have a good time. The more adventurous Tourist may take mass transit, but most will walk, blisters and all, from morning until night, for days, probably in new shoes bought especially for the trip (rookie mistake #1). It is important to understand that everything the Tourist sees is brand new to them and often not understood. Common things look different in different countries. Stores sell different products. A coffeeshop (one word) in Amsterdam is not where you get a cappuccino. This Tourist is grappling with many things simultaneously, more than how to get from the church square to the world-class museum and back to the hotel. Let’s just say, the Tourist could be confused, hungry, tired, and/or possibly in pain, in any combination, at any given point. This is why a tourist map must be clear and concise and make the Tourist feel comfortable. It must be easy to use. A map of Dalkey, just south of Dublin. This hand drawn illustrative style makes Dalkey look like a friendly and welcoming place, which it is. 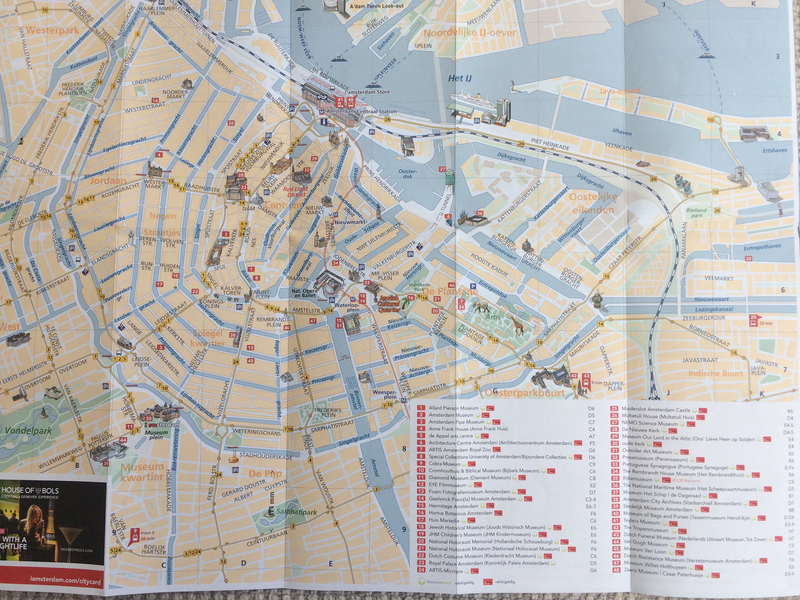 Ok, so how do you design a map for the average tourist? Oh wait – there are more questions before we start. What is a map? A map is a diagram, or schematic representation of a specific place. A map is primarily made of lines, colors, text and some type of imagery. A map has a scale, meaning there is relationship between the sizes and distances on the map and those sizes and distances in reality. The map can be for one street corner or an entire country, or continent, or anything in between. What is the purpose of a map? A map of a place can be made for many reasons. It can show property borders, or geological structures, or it may indicate heights of mountains and directions of rivers. A map explains a complex three dimensional space in a two dimensional form. This post is about general tourist maps, so let’s conclude the tourist map must 1) inform the Tourist of the location of major attractions, restaurants, retail stores, notable neighborhoods, and transit hubs, 2) provide street names, and 3) help the Tourist navigate comfortably in a place for a few days. Now that we have defined whom the map is for and what the person should do with that map, we can start to think about the map in terms of design. Hierarchy. What is the most important thing on this map? It will probably be major tourist attractions, and streets with street names. 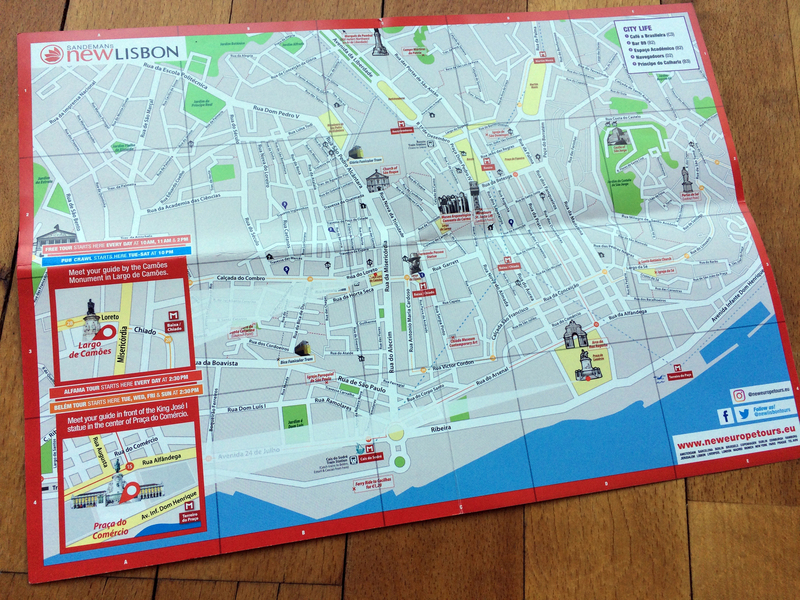 If you receive the map at your hotel, conveniently your hotel is prominent on the map as well. Hierarchy on a map is created through the use of color or pattern, line weights, scale, typography and images. Simplify. If you mapped ten blocks around any given point in any city, you’d find hundreds or maybe thousands of things to map. Newstands, doctor’s offices, shoe stores, bus stops, dry cleaners, museums, police stations, cab stands, bakeries, jewelry stores, repair shops, grocery stores, delivery services – a slice of an entire cast of characters and scenes that make up any city. The Tourist does not need to know about 95% of this. Leave it off the tourist map. Too much information makes the map confusing and thus confuses the Tourist and makes them uncomfortable. Did you know that you are demonstrating a bias when you add or subtract things from a map? All maps, like all designed things, have a point of view, even if you try to project a neutral voice. Choose carefully to create a balanced overview of the area. Due to limited space on your map, you may have to make some hard decisions. I love this map of Dresden. 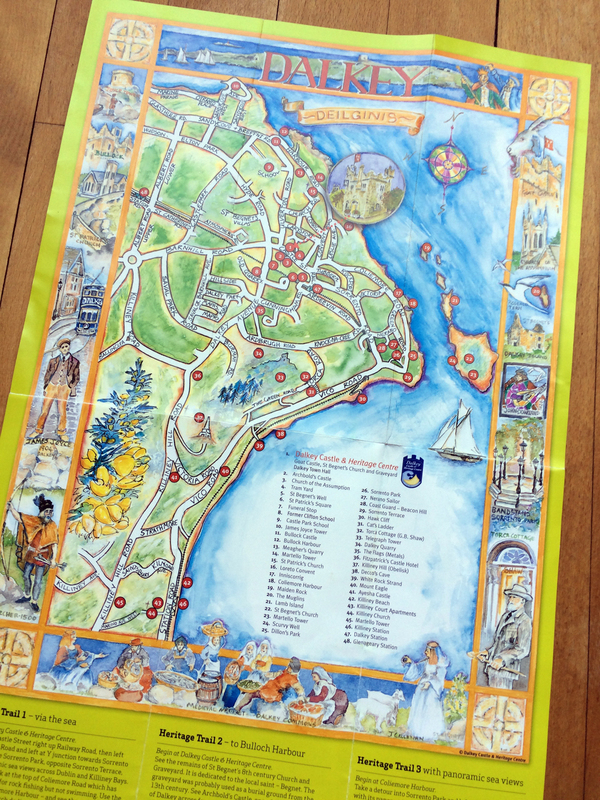 It is hand drawn, but has a very different feel from the Dalkey map. It folds neatly into its small attached cover. The color palette is made of only a few colors, but it is effective in showing where green spaces are and a suggested walking tour is highlighted in yellow. The streets pop against the dark warm grey background. Not all the streets are labeled, but this helps keep the map “clean.” The text is limited to place names, so translation is less of an issue. The type is hand drawn, large and easy to read. Contrast. A tourist map must make full use of contrast. This is not the place to be subtle. The Tourist wants to find things fast. Contrast can be easily achieved with color and scale. At times, spacing can also be used, but generally speaking, spacing is set by the streets on the map. Color. Where is the tourist when they are looking at your map? Are they sitting comfortably at home with their favorite pup or kitty in their lap, with a warm cup of tea and good lighting? No. They are standing on a busy street corner in a foreign country, staring at a map, wondering how a street name can have 17 letters and only 2 vowels. And they are getting hungry. This is not the time to use all pastels or put lots of small white type on a black backgound, or even worse, a yellow background. Use pleasant, but contrasting colors, to make things stand out and easy to find. The colors you choose should relate to your subject matter and can help convey your message or invoke time period. Color can set the scene for the Tourist as they explore. 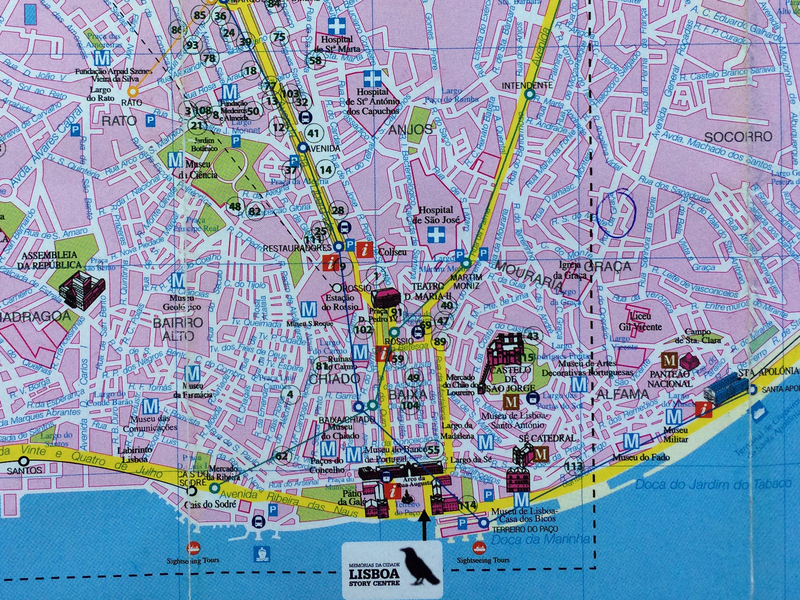 This is the map I was given in Lisbon. I found it very hard to read and couldn’t use it. The scale (overall area of the map) was too large, making the streets tiny. The overall map has an even tone with little contrast, so nothing stands out. The type was too small and in cyan blue, making it very difficult to read while on the street. Oddly, the enlarged area on the left has a similar scale to the overview map and had the same problems. 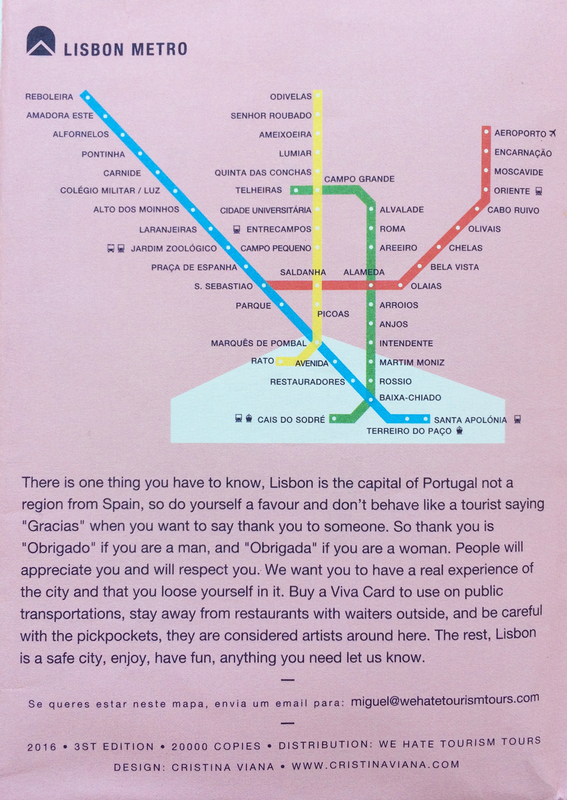 I later found this map of Lisbon, from a tour company. It was much more manageable. 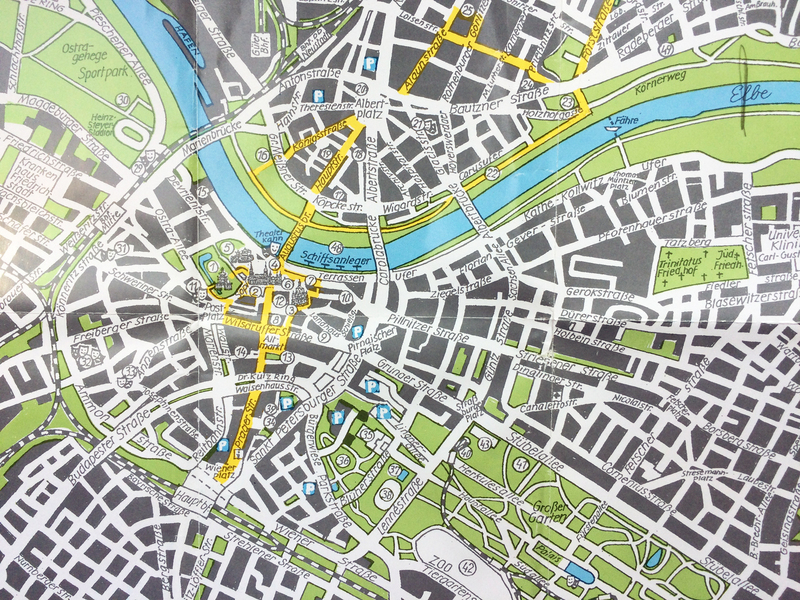 Tour companies are good sources for free maps. Of course their advertisements are on the map. 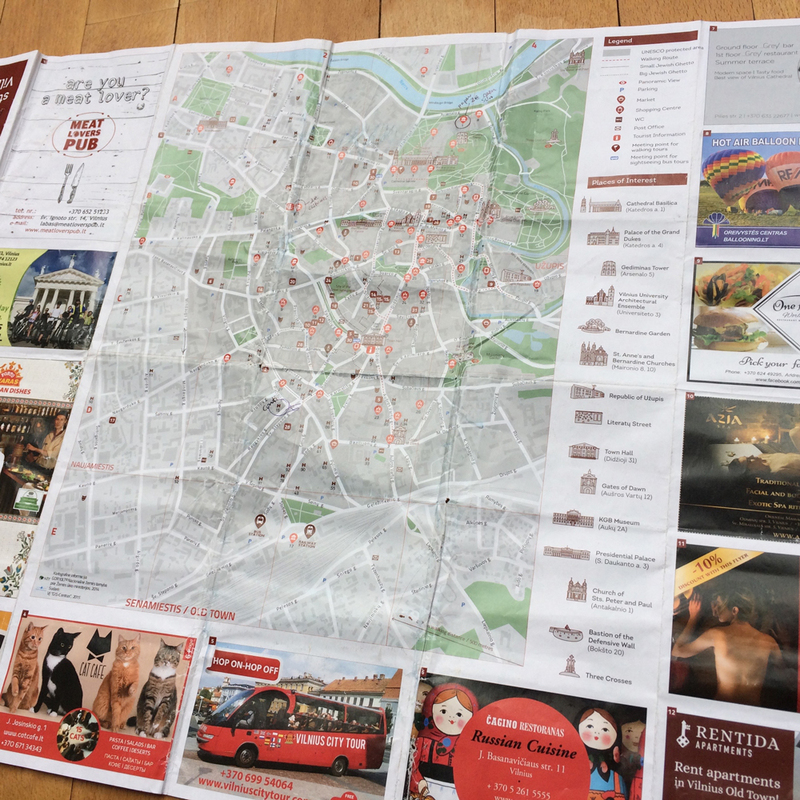 Free maps are usually a vehicle for advertising. Scale. Maps have limited space by virtue of the street plan and the size of the paper they are printed on. You can manipulate scale by changing size and also by making things out of scale from the rest of the map. On a tourist map, scale (distance) does not have to be entirely accurate. Areas of interest for the Tourist can be larger and out of scale, just keep the sequence of things in order. Main streets can be made a little wider, or attractions can be moved a bit to accommodate place names. When designing indicators for the map, you can use different sizes for groups of things. Attractions might be one size. Restaurants might be a little smaller. 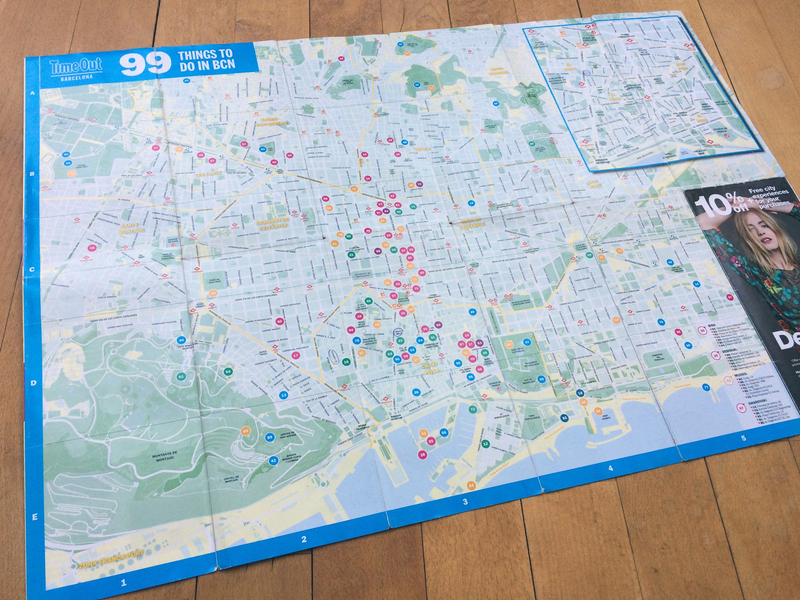 99 Things to do in Barcelona, but this map was unmanageable. First, it was on a huge piece of paper. It took too much folding and unfolding to find what you needed. Second, it just includes too much information. Everything is numbered, which makes for a clean design, but you have to keep turning it over to reference what each number is. Try doing that on a street corner. It would be better to study this map in your hotel. 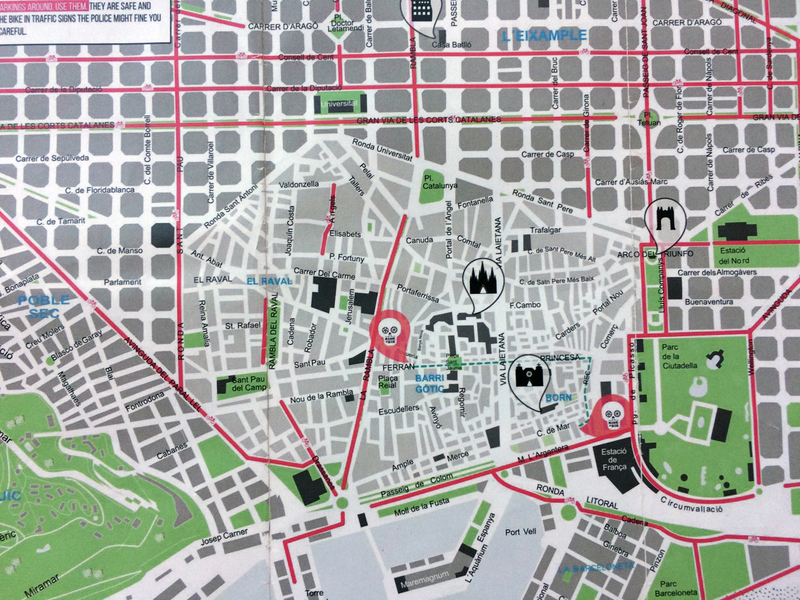 I stumbled onto this little free map of Barcelona from a bike tour company. It was small and could be folded/unfolded quickly. It has bright white streets that pop and a limited color palette. There are a few symbols of important buildings (as seen on their tour) and just enough street names to keep you moving. The red lines are major bike lanes. The skulls show where their rental locations are. This map also educates the viewer on the structure of Barcelona’s street plan, with the square blocks of Eixample surrounding the cramped blocks of the old city. Also, as I discussed in another post, the city is oriented with the sea and Eixample parallel the paper. North would be pointing toward the upper right corner, not the top of the paper. Typography. No teeny tiny type please. Your Tourist’s feet hurt, their phone ran out of juice and they are already supposed to be in line for their 15:30 Van Gogh Museum tickets. They have to locate the museum on the map, determine which streets will get them there, all while they figure out what time 15:30 really is. They need clear, legible type on everything, even if it’s small. Keep the flowery stuff for the cover panel. 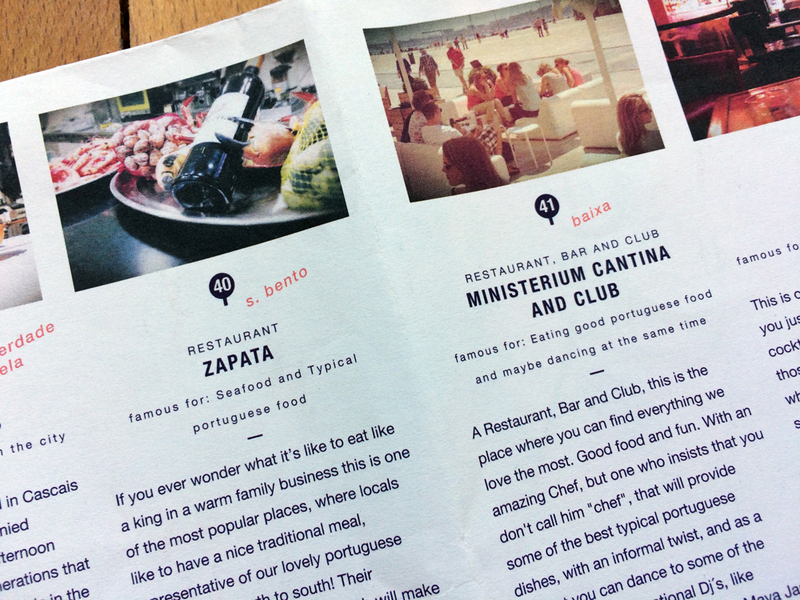 You can use serif or sans serif, just be sure it has enough space around it and contrasts to the background. If you use upper and lower case, don’t let your descenders touch the lines of the streets. Type in all caps should have adequate spacing above and below. Avoid italic type on maps unless you are trying to highlight information. There is a lot of information on this map of Dublin. Although it is not the prettiest map in my collection, when I found it, it helped me understand the city. The type has a clear hierarchy. It is all caps, but legible. Different sizes of type are used for different information – larger type for districts, smaller all caps for attractions and upper and lower case for further information. This map also uses color effectively (again, it ain’t pretty) to show major streets and different districts. The lines with arrows indicate walking routes and the numbered discs are points of interest along the route. The bridges across the River Liffey are a main attraction. I like how they oriented them sideways, so you can see what they look like. 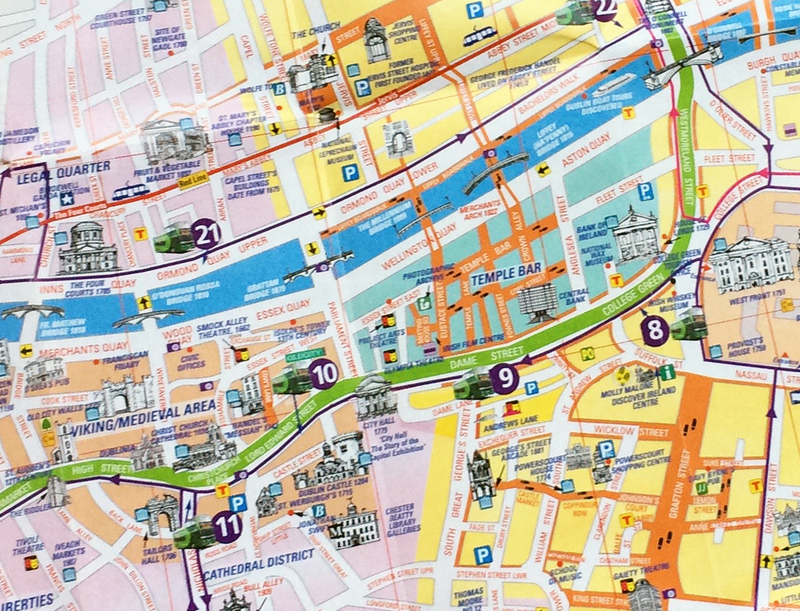 This map teaches you a lot about Dublin. Symbols. Yes, please use symbols, or very abstracted (simplified) drawings. Symbols are good shorthand for maps and other information design because they can be understood quickly. Symbols, or icons, are most effective when you have to indicate different locations for similar things, like monuments. Using one symbol to signify “museums” is good. Creating an individual symbol for every different museum on your map will be confusing. Your Tourist will have to always be consulting a key to decipher the symbols. If you have room on your map, pair the symbol with the name of the place for double information. Your Tourist can use all the help she can get, because her feet are killing her and she’s carrying her coat because it’s hot now. 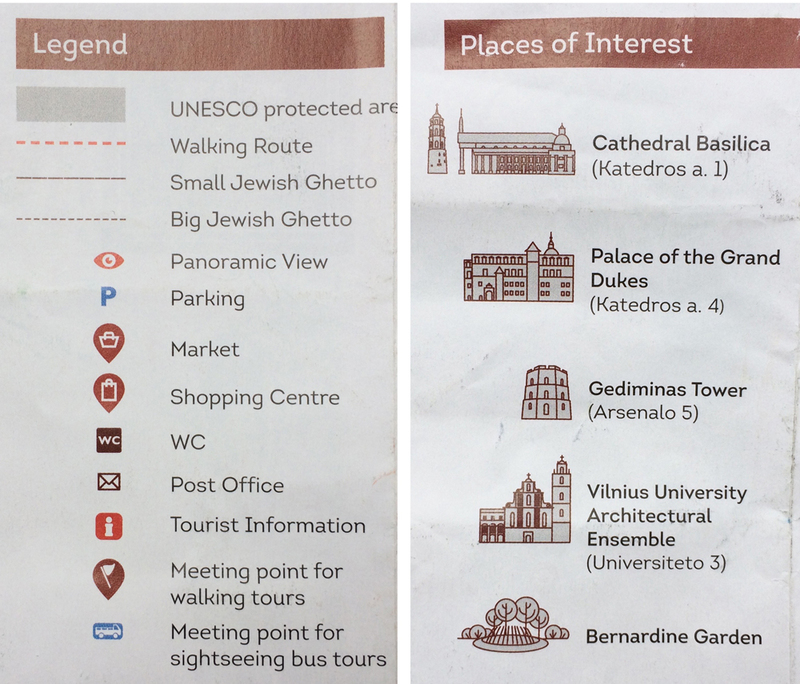 This map of Vilnius demonstrates how to use symbols on a map. First, they are simplified and very easy to “read”. There aren’t too many different types and they are keyed to a legend. These symbols have three different pieces of information, 1) icon, 2) color and 3) shape. 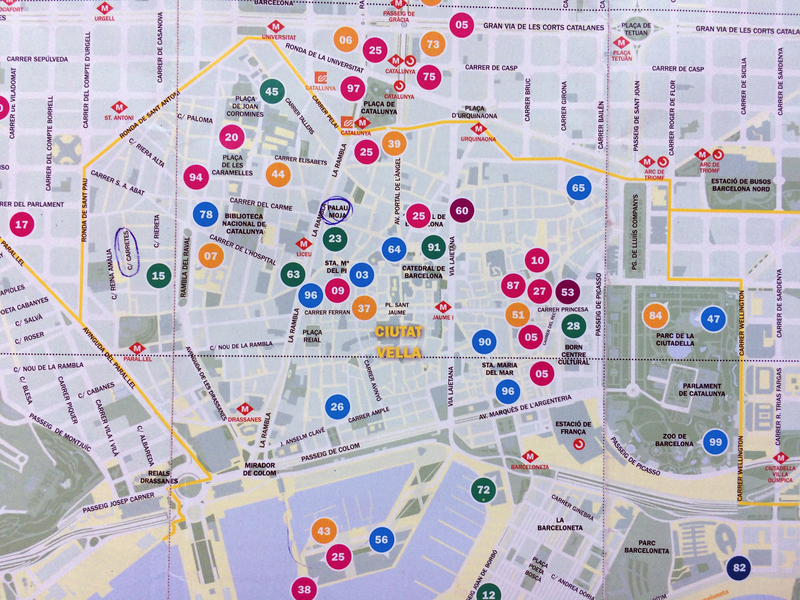 This map of Barcelona shows an example of indicators or “symbols” that are less useful for the Tourist. The different color of the discs helps a little, but you have to memorize that blue means “restaurants” and red is “shopping.” Color can be an aid for hierarchy, but color itself is not hierarchical. 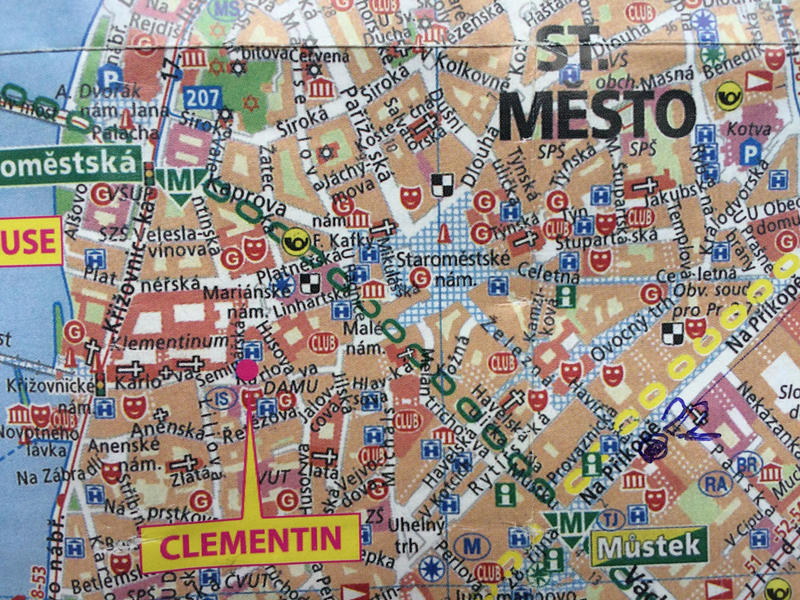 On a tourist map, color works better when used with a second indicator, like shape or a small icon, as with the Vilnius map above. None of the circles above catch the eye as something unique. They all look the same. Images. Remember, the Tourist doesn’t know anything about where they are. Aside from the Eiffel Tower, Big Ben and the Empire State Building, most people do not know what specific buildings in other cities look like. Small, simplified drawings of buildings or attractions, placed on the map are very very helpful. In my opinion, drawings are easier to “read” than photographs. Photographs have too much unnecessary information, such as surrounding buildings or trees. The Vilnius, Lithuania map wins. It’s a great free map. Limited color palette, White streets that pop. Buildings are indicated in a subtle gray/light gray shades. Letterspaced type in the streets increases legibility. It has a great combination of abstract symbols and fabulous simplified drawings of major attractions. The buildings are out of scale, but they do not obstruct other information. This map was very easy to use, and it got used each day, as you can tell by the wear! 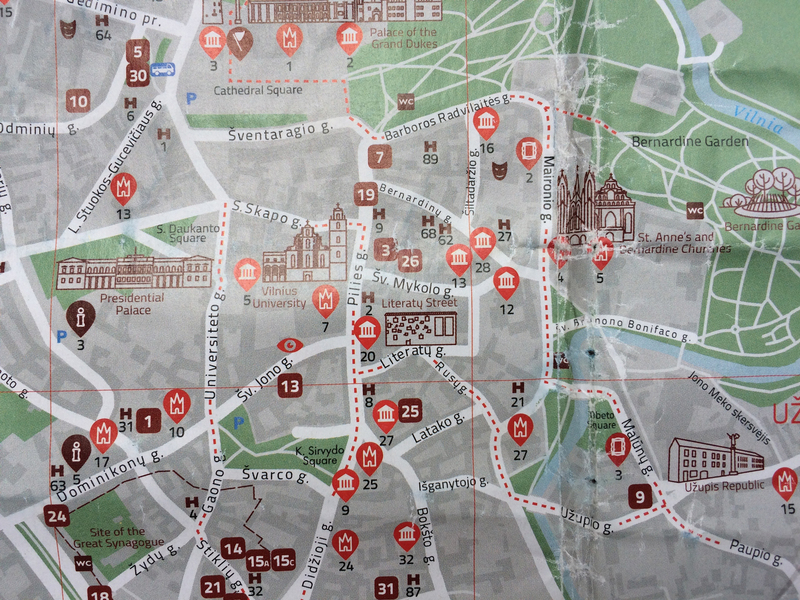 Quick, on this tourist map of Prague, point to the Prague Castle! Can’t find it, how about the Charles Bridge? You’ve never been to Prague, would you think the yellow flags are attractions, restaurants or hotels? They are hotels. Guess who created and distributes this map? 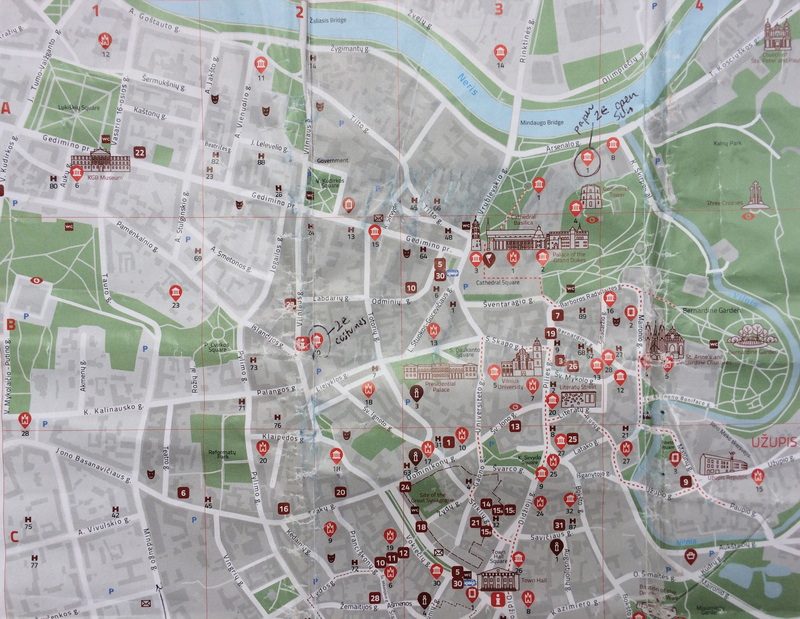 Sadly, this ambitious map of Prague is the losing entry. It breaks all the rules I’ve mentioned above. Every single thing that can be fit on the map is on the map. The only thing that stands our are the hotel names. Every time I looked at this map, my eyes crossed. I couldn’t use it, even when sitting in a quite hotel room. Lastly, the overall map as a piece of design should be balanced. You can’t move streets or rivers (too much), but you can play around with the other map elements, such as titles, information keys, the scale indicator and various text boxes or other images. You may embellish the map with illustrations or photos. As you design, hang the map upsidedown and stand back to look at it. Right away you’ll see what is sticking out or too big or too small. This is a trick you can use to see if any design is balanced and holding together. 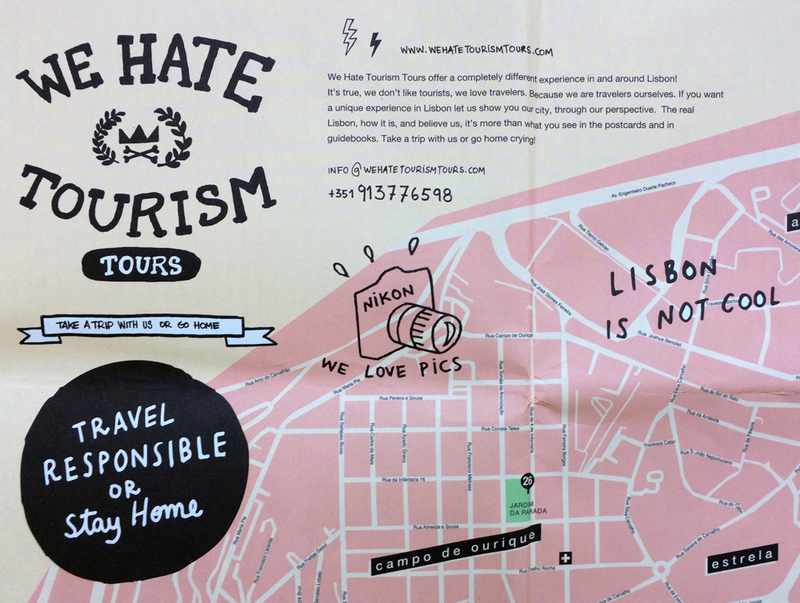 I found this cheeky little map of Lisbon in an “alternative” shop. It has fun commentary and a friendly, hip look and feel. This map is geared toward a more specific audience (perhaps those that know the virtue of using a Nikon). Numbered discs are keyed nicely to explanations and photos on the opposite side. 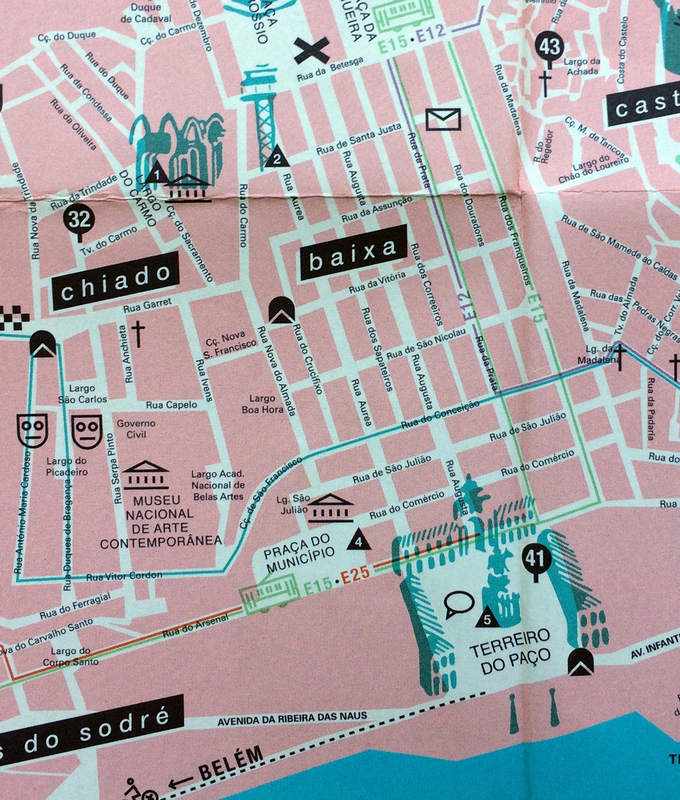 It’s interesting it uses pink and blue like the other Lisbon map I got. It’s got a wicked sense of humor and is worth enlarging the images to read the text. Ok, you know you’d love to have this map in every city! 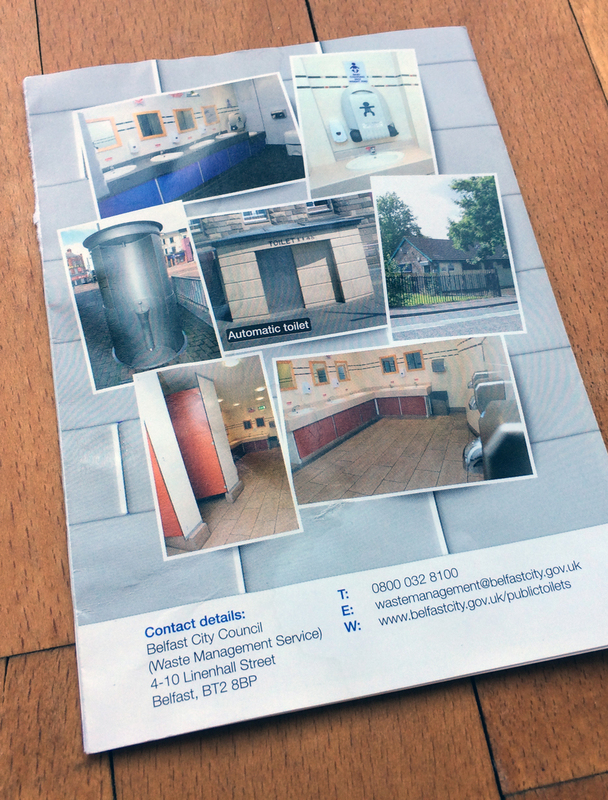 This map from Belfast hits all the marks, although that’s easy when you limit what you want to present. A wall of clean white tiles greets you on the cover. 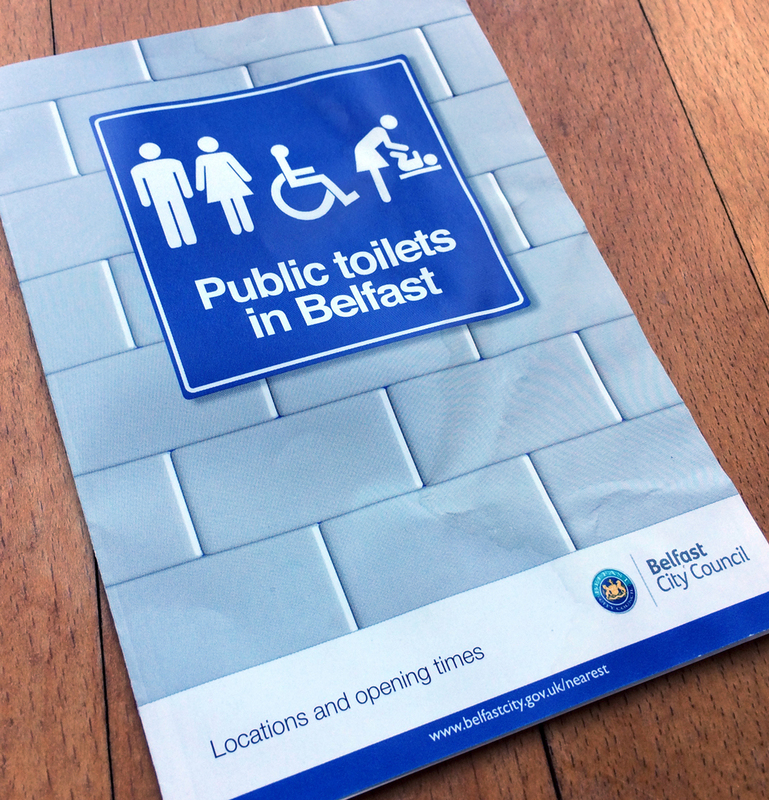 The title borrows familiar international visual language for restrooms, merging humor with comfort – you don’t need to read the text to understand the content of this document. The map itself has been simplified to the basics, streets, the major attraction to orient you and numbered discs that are easily keyed to more information. The bonus on the back is photos of that ever important facility. Bravo! 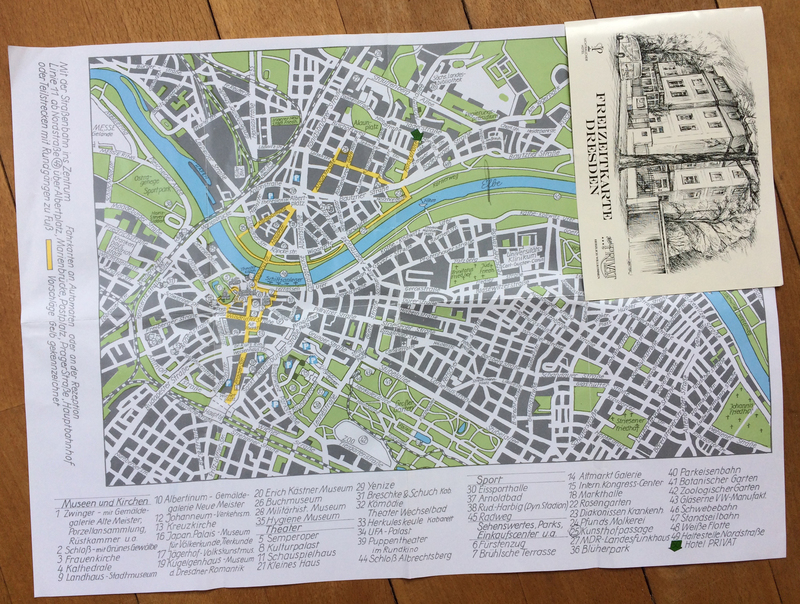 A tourist map can be a good free souvenir, especially if it’s designed well. Every time you look at that map, you will be filled with memories from your trip. I’ve collected many more than I show here! –All of these maps are used without permission! Previous Post How do I get there?